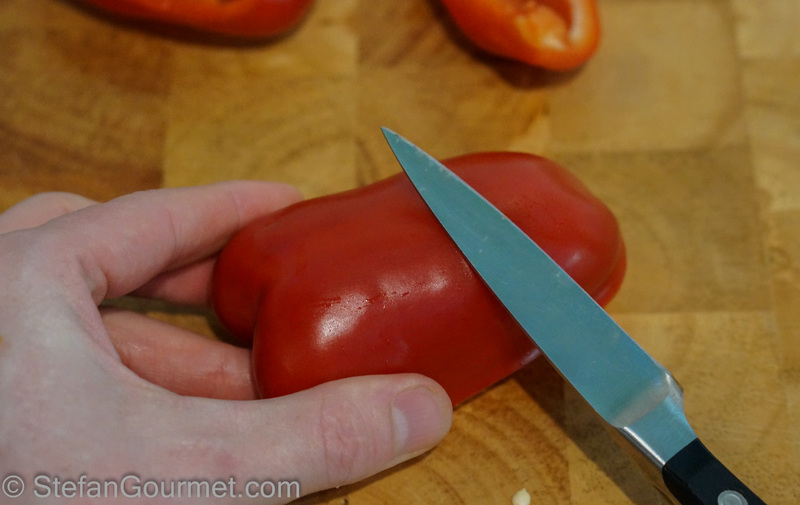 In a change of pace from a very involved preparation and a very sophisticated meal, in this post I’m going to show you how I cut bell peppers quickly and with zero waste. A lot of food is wasted. The statistics are staggering. One of the ways in which food is wasted is by wasteful ways of cleaning and cutting. For example, the way in which many chefs are taught to mince an onion, about a quarter of the onion is not used (but can of course be reserved to use to make a stock). 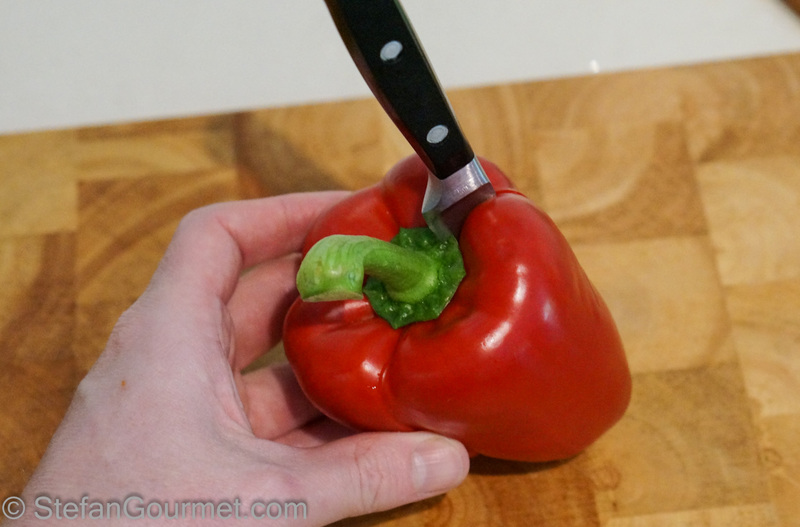 I’ve also noticed people cleaning a bell pepper by cutting off the top part, thus wasting quite a bit. Here’s how it can be done differently. 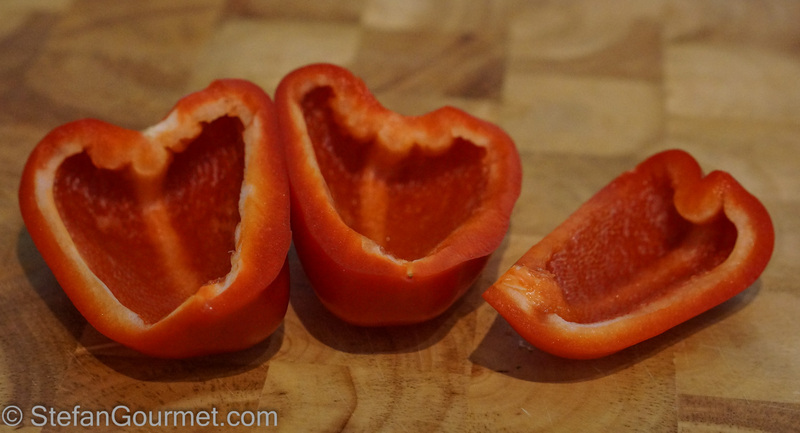 On the outside of the bell pepper you can see where the membranes are inside by the indentations. 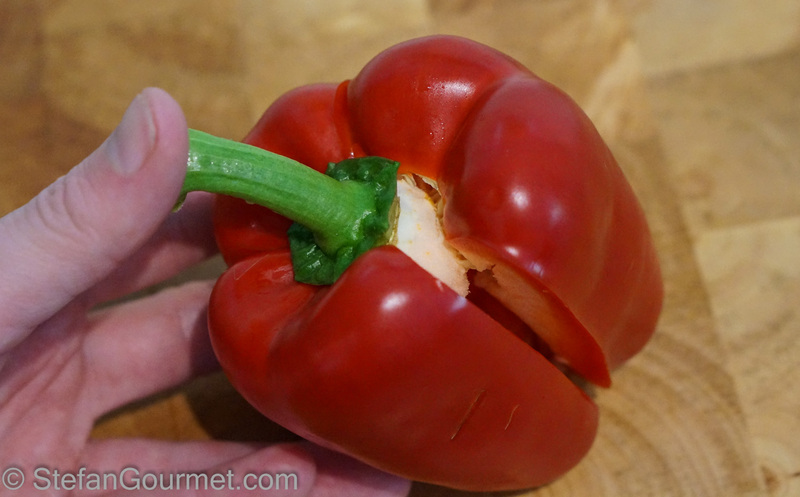 Starting from the bottom of the bell pepper, cut along those indentations with a small sharp knife. Keep cutting until you reach the green stem. Repeat with the other indentations. You can now easily break off the segments of bell pepper from the green stem and the internal white part to which the seeds are attached. You do not need a knife to do this. Now cut away the white membranes using a small sharp knife, which is easy to do because they will be at the edge of each segment. Hold each segment with the outside up and tap on it with the flat of the knife to encourage any remaining seeds to fall off. 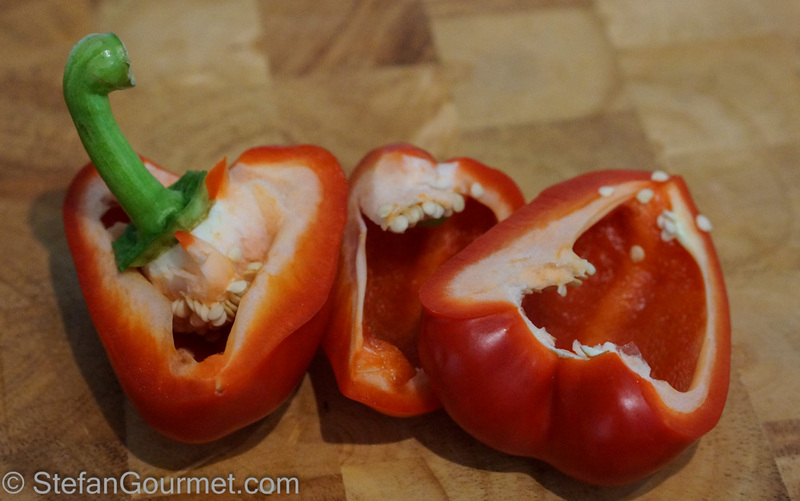 And voilà: bell pepper segments without any loss, ready to be cut into strips or diced using a large sharp chef’s knife. Our favorite vegetable to prepare on the grill is the green asparagus. It is quick, easy, and very tasty. Just break off the woody end (which if you do it carefully is not wasteful) and toss them with olive oil, salt, and freshly ground black pepper. A rack is a great tool to prepare grilled asparagus, as turning them one by one would be quite a chore. We like them best when they have been roasted on a slow fire such that they are nicely browned (not blackened) and tender. This really enhances their flavor. Even people who generally don’t enjoy vegetables, love these. Nice tip! I always like the find optimum methods like this. I do a different method which I prefer. I cut the top off but in such a way that the stem falls out of the top (you cut at the height where the stem meets the flesh, so no wastage). You then cut off the bottom as well, both top and bottom can be easily sliced or diced. With the middle, you cut into one side then sort of roll the knife around the inside of the flesh,r emoving the pitch and seeds, and getting a single clean strip out of it. From this you can cut it in three, stack them and slice them very quickly. I think I saw the technique years ago from Ken Hom but i prefer it as it avoids having such curved sections as your way, which makes for easier slicing or dicing. It works less well on smaller peppers but on regular sized ones it works great,. Hi Owen, glad to see you back and thanks for explaining your way of cutting a pepper. It is nice to see that there are even ways I had not thought of before. Have you tried to make malloreddus again? This is an interesting one! Personally to avoid having to play too much with the seeds I use a technique common among Chinese chefs. 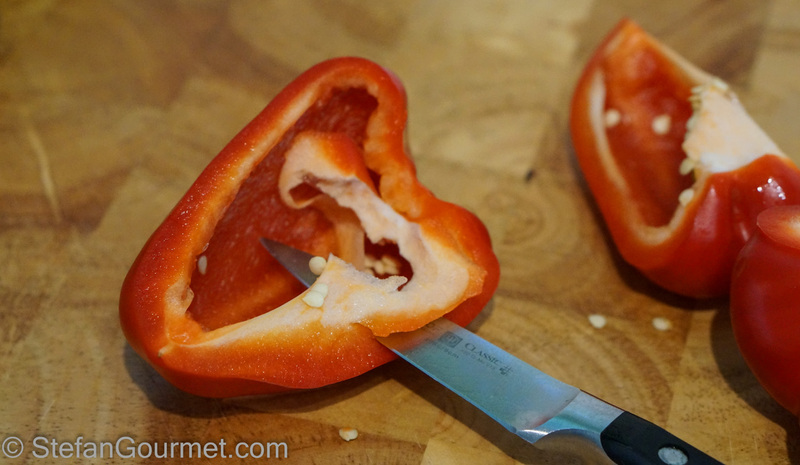 With a big knife you cut into the side almost tangent to the surface and then roll the pepper. Hi Matteo, it is so nice to see all the reactions and different methods. Thanks for sharing! Nice simple stuff Stefan. I have been cutting around the core and then slicing as shown. I will change my approach. Next Next post: Hot Smoked Salmon, Dry or Wet Cure?